I should change my screen name to Lazy. I've been lurking on this board for 5 years now and should probably get rid of that big fat zero in my post count. I've been kayak fishing since 2006 when a friend introduced me to it while I was living down in San Antonio Texas. I was immediately hooked and tried a number of boats outs before getting a 2007 Liquid Logic Manta Ray 14. I love that boat and have had a number of others come and go, but I still fish mainly out of it. That said, when the kids get a little bit older I will be switching over to a pedal drive kayak. I'll be 52 this year and as much time as I spend on the water it will be good to give the shoulders a rest and still get after it. I'm over on the east side of Big Bay Point and too close to the Friday Harbor Marina. That is going to ruin a few of my spots for SMB when they open the marina to all that boat traffic and I am hoping it doesn't make it too dangerous for us on K-Bay during laker season. Already crazy enough floating around out there. That friend that got me into kayak fishing went on to have his own show, his name is Ty Southerland, and its called 30 Miles Out. We had a lot of good times in his boat and our kayaks before we both moved away. I wish I could make a living fishing !! Great to have you aboard, Chris. Sounds like you live in the Orangeville area? Howdy All! Been padding for while, just started taking my fishing gear along couple years ago. Bought a proper Fishing Kayak last summer, Pescador Pro 12. Really enjoyed it. Gonna ‘upgrade’ to a Feel Free Lure 11.5 for the standing option, as soon as this damn weather lets up. Usually I just fish Island Lake, or a bit on the Grand River, but i’m Looking at trying Belwood this summer, or maybe Ken whillans. I'm a Caledon Ex-Pat now living in Guelph. This is a great place to meet other Yakkers to get out for meet-ups at local lakes. Hope to see you out there once the ice melts! Hello all. 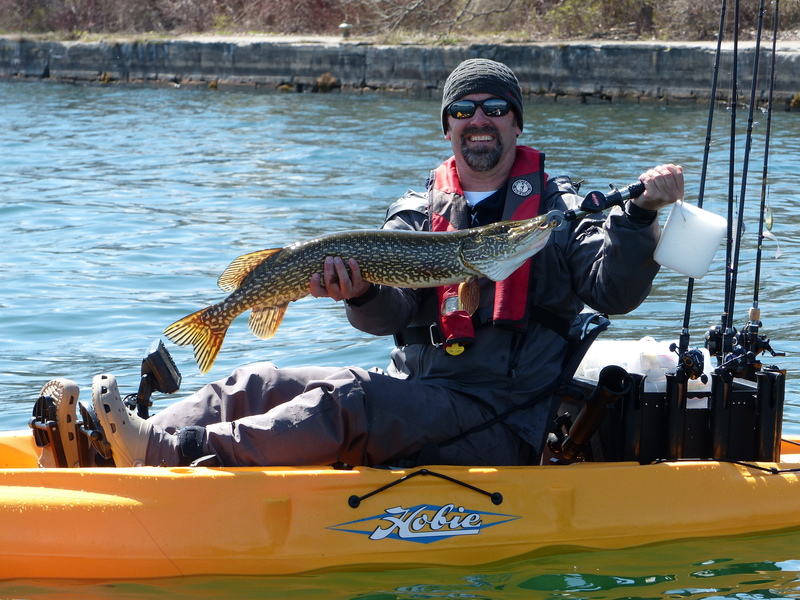 Franco here... new to the forum, and will most likely fish some yak tournaments in southern Ontario this spring / summer. I live in Caledon, and it would be cool to meet some other anglers that fish either Ken Whillans, and or, Island Lake as those are close by. Hey Unchained, sorry for the late reply. Yes I bought my Yak at the boat show. Hey Red Rocket, I am in Kawartha Lakes(Pigeon, Sturgeon are the closest lakes to me with lots more around) Ontario. I just bought me a 2018 Hobie PA 14. Cant wait to go out on the water. Welcome to Yakfisher! Let the rigging begin! Welcome to the forum. You'll have plenty of opportunity to hook up with other yakfishers once the water softens up a bit. What part of the province to you live in and what's your new ride? New to kayaking and kayak fishing. Looking forward to go out this spring as I just bought my first Yak at the boat show. Looking forward to learning from you all.